Just like the others, Natsume is a half youkai (demon) and half human. He is the pair of Banri. He has a cheerful personality and usually wears Bunny ears. He is particularly fond of Soushi and tenderly calls him "Sou-tan". Zange has red hair. Under his bandage on his forehead, he has a third eye which he uncovers in his youkai form. He is usually seen wearing a black suit and black gloves in his human form. In his youkai form, he has eyes all over his arms and an eye in each palm of his hand. He is 21 years old. In this timeline, Natsume is now Kagerou's SS agent. He is still childhood friends with both Kagerou and Soushi. Just like the others, Natsume has all of his memories and persona of his past life due to his youkai abilities in being able to see all. This time around he is very active in the story by helping recruit the main cast while investigating over the raid 23 years ago with Soushi, secretly. He works together with Renshou, Kagerou, Karuta, and Nobara to stop the next raid, and this time without anyone dying. He still has anemia, though. 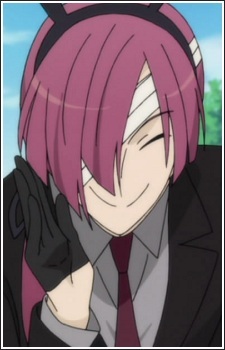 His only changes are trading his rabbit ears for a top hat, and his bandages for an eye patch. All the residents of Ayakashi Kan have a monster form, but with the building constantly invaded by yokai, they are just the tip of the monster iceberg. But with so much monster activity in Inu x Boku SS, who are the real monsters?